Our closets booth at Toronto Home Show has a wide variety of the different offering available from Toronto Custom Concepts including granite island, double hutch, glass shelving and over 20 different closet accessories. Make sure you stop by our closet booth as we will be giving away some great prizes and gift certificates. 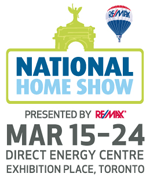 See you at the Toronto Home Show!